Not Not – A Brain-Buster, what game is that? And.. What makes it different from the rest? Read all about it in today’s short featured game article. The developer has given you his explanation of his game, and we hope you’ll like it and will try out the game! 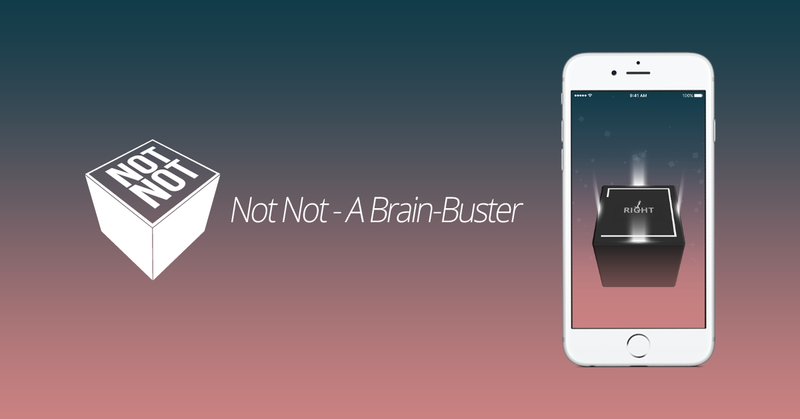 Not Not is an innovative puzzle game designed to trick your mind and reflexes. The gameplay is very simple: just follow the instructions displayed on the cube and do the right move: swipe right, left, up, down, or simply nothing. It might sound easy but those instructions could quickly become confusing, especially when you only have a few seconds to take the right decision. What would you do on this kind of instruction? Would your brain be freeze? Not Not is the first game to mix orientation, logic, and reflexes in one clever gameplay. The deep level design will increasingly become harder and diversified, introducing new concepts in each new unlocked world. For example, negation (negative instructions such as “not left”, or even double negations such as “not not down”), colors (red, blue, yellow, green, not green, etc. ), logic (Red And Left, Up Or right, etc. ), etc. Not Not is a simple game, for everybody, but at the same time very deep, cleverly designed. With more than 7 millions of players in the world, it is also a very good way to improve brain skills, reflexes, logic, and orientation skills. Simple mobile games can be fun, addictive and useful! In addition, we’d like to remind you that there is exactly one week left until the 14th IMGA. Yep, time is flying! Therefore, if you haven’t given away your vote, do it now! Also..Don’t miss out and get your ticket as well ;)!